Okay people, I’m super excited. 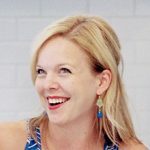 I’m doing a cookbook giveaway tomorrow and I am positively thrilled about it. You see, I get an obnoxious amount of inquiries regarding potential product reviews. Mostly, companies seem to be seeking free advertising via my blog as an outlet but often, the product is the sort of thing I just don’t use in my kitchen – baking mixes, unitasker gadgets, etc. Since I try to keep the focus on food, I rarely accept these offers. When I opened this particular email, however, I nearly jumped out of my chair with excitement. The cookbook? The America’s Test Kitchen Healthy Family Cookbook. You know – the same people responsible for Cook’s Illustrated, my favorite cooking magazine, and Baking Illustrated, my favorite baking cookbook? Yeah, I was pumped. It took me about five seconds to agree to this review. I’ll discuss the book itself in greater detail tomorrow but for today, I am sharing the first recipe I tried from the book: these fruit, yogurt and granola parfaits. Stay tuned tomorrow for my review of the cookbook, another recipe from the book, and your chance to win a copy autographed by Christopher Kimball, the publisher and editor of Cook’s Illustrated, etc. 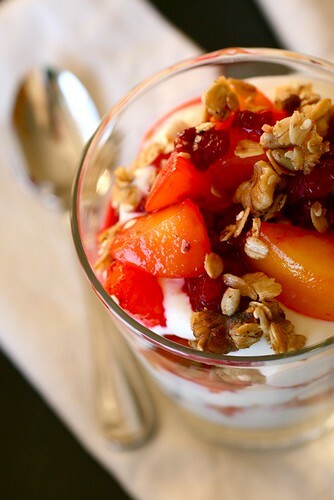 *Note – You can substitute lower-fat Greek yogurt here if desired; however, the parfaits will taste less rich. 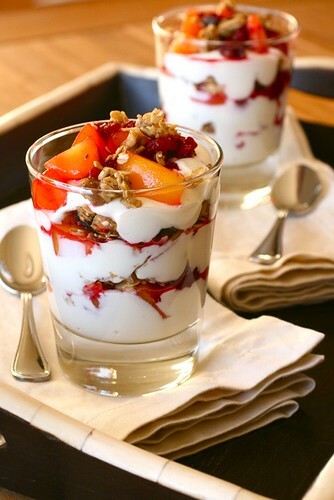 Serve the parfaits within 15 minutes after assembling or the granola will begin to turn soggy. Whisk the yogurt and honey together -thoroughly. Using four 16‑ounce glasses, spoon 1/4 cup of the yogurt-honey mixture into each glass, then top with 1/3 cup of the berries, followed by 2 tablespoons of the granola. Repeat the layering process two more times with the remaining yogurt, berries, and granola. Serve. Add 1 teaspoon ground ginger to the yogurt with the honey. Substitute 2 cups raspberries and 2 peeled and chopped nectarines for the mixed berries. Microwave 1 cup chopped dried dates with 1 cup water on high for 30 seconds; drain and let cool. Add 1 teaspoon ground cinnamon and 1/2 teaspoon ground nutmeg to the yogurt with the honey. Substitute the softened dates, 3 thinly sliced bananas, and 2 segmented and chopped oranges for the mixed berries. Adjust an oven rack to the middle position and heat the oven to 325 degrees. Toast the almonds and walnuts in a 12‑inch skillet over medium heat, stirring often, until fragrant and beginning to darken, about 3 minutes. Stir in the oats and oil and continue to toast until the oats begin to turn golden, about 2 minutes. Stir in the sunflower seeds and sesame seeds and continue to toast until the mixture turns golden, about 2 minutes. Stir in the raisins. With a spatula, push the granola onto one half of the baking sheet and press gently into a 1/2‑inch-thick slab. Let the granola cool to room temperature, about 30 minutes. Loosen the dried granola with a spatula, break into small clusters, and serve. The granola can be stored at room temperature in an airtight container for up to 1 week. Substitute 1 cup chopped dried tropical fruit (such as pineapple, papaya, and/or mango) and 1/4 cup unsweetened shredded coconut for the raisins. Substitute 3/4 cup dried cranberries and 1/4 cup finely chopped crystallized ginger for the raisins. Substitute 2/3 cup peanuts, chopped coarse, for the almonds and walnuts. Reduce the amount of oil to 2 tablespoons and stir 1/4 cup creamy peanut butter into the oat mixture with the honey and flaxseed.